How often are we completely consumed by our day-to-day activities and fail to see what else is going on around us? Most of us are busy these days, particularly in the healthcare industry. We get caught up in the daily grind of emails, conference calls, meetings, clinical functions, and addressing patient needs. These activities consume countless hours, and without realizing it, an entire day, week, or month will disappear. With this momentum carrying us through our daily professional life, it is important to carve out time for higher-level thinking. 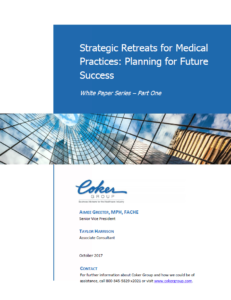 In this whitepaper, we examine the active process of strategic planning specifically for a medical practice. The goal is to assist your strategic planning efforts to ensure that when you do take the time for a retreat, you will make the most of it.